With an opening that is much wider than it is tall, the linear model blends old world and new world styles to create the perfect fireplace for modern designs. Our Linear model is compatible with either masonry chimneys or UL 103 metal chimney systems. 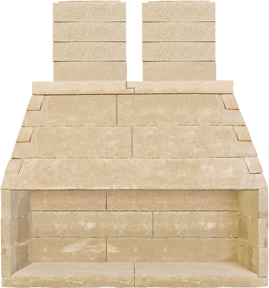 Available sizes: 60" and 72"
All FireRock indoor models can be used indoors or outdoors and can accommodate practically any veneer, mantle or surround. Popular indoor options include marble, ledgestone, wood, brick and stone veneer. Popular outdoor options include man-made stone or sliced natural stone. For ideas and inspiration on how to customize your surround, click here. Additional customization comes with your firebrick selection. FireRock firebrick comes in two colors - red and buff - and two thicknesses to accommodate a variety of firebrick patterns to finish out your personal taste. Dimensions do not include firebrick lining. Chimney diameter dimensions are for refractory masonry chimney and UL 103 listed metal chimney. Opening to Combustible Trim: 12"
Opening to Mantel with 8" Depth: 16"
Firebox and Smoke Chamber to Combustibles or Framing: 1"
Smoke Chamber to Front Wall and Smoke Chamber Top to Wood Framing: 1"
Not sure what direction you want to take with your next project? Contact us to learn from our experts.